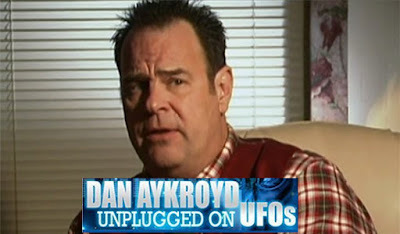 In the must-see documentary Dan Aykroyd: Unplugged On UFO's director David Sereda spoke to the legendary Ghost Buster himself Dan Aykroyd about ufology (Dan is practically an expert on the top) and other interesting things. At one point, Sereda asked him to explain an MIB experience he had back in 2002. “What happened was, we sold the show to the Sci Fi Channel and it was called Out There and I basically interviewed all of the people I admired in various fields of study like Colin Andrews in the crop circle movement, Linda Moulton Howe, the expert in cattle mutilation, John Mack.... I talked to him. I talked to the Allagash guys who were taken in a canoe in the trip in Maine and I, I mean, the last show we did, I had both Bassett, who has the UFO time clock and Greer, both Bassett and Greer were there. They were my two guests for the two. Well, the show was cancelled that afternoon and I was outside, before I knew it was cancelled, in between the interviews and, uh, I was outside and Britney Spears called me because she wanted me to appear on Saturday Night Live with her. And so, I was outside having a cigarette, the phone rang, I was like, 'Hello Britney, how you doing?... Sure, of course I will...' I turned away like this (moves head to left), I turned back (moves head back towards camera) and there was a black Ford across the road, a black Ford Sedan and I was trying to look at the plate but the plate seemed kind of fuzzy and... Definitely a police car and two guys were there and a big, big tall guy got out of the backseat and he stood in the street, on 42nd Street it was. We were on 42nd Street and 8th avenue and he looked right at me and literally, I was on the phone 'Sure I would love to' I look back, saw the Ford, went back like this, turned back like a half a second later, and it was gone and that car did not go past me. It did not make a U turn because I would have seen... 42nd Street, I would have seen that thing take a U turn and go away. That car vanished! That car was a cloaked vehicle of some type and whether this was like a warning to me because the guy that got out of the backseat gave me a real dirty look. That car vanished. I know what I saw. And it was just this fast, talking on phone, guy gives me a dirty look, talking on phone, car gone. That's what happened.